We are excited to have you as a part of our team. 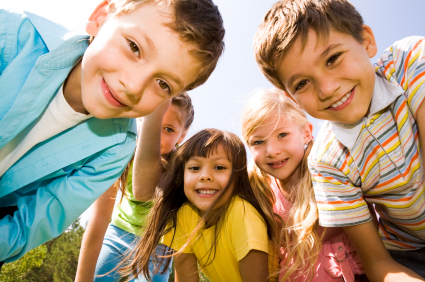 As a new member, we have laid out some of the groundwork for you to get your Parent Group site started quickly. This initial design is based on researching thousands of parent groups, but it may not be perfect for your needs, so you can always change and modify it as you see fit! 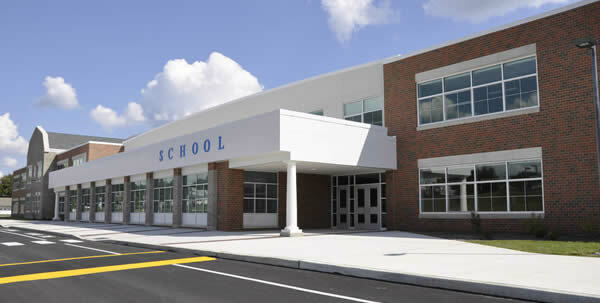 Be sure to visit our Digital PTO Help Center for answers to almost all of your questions. Our Help Center is loaded with information and tutorials in a very easy to follow format that should take care of the majority of your needs. 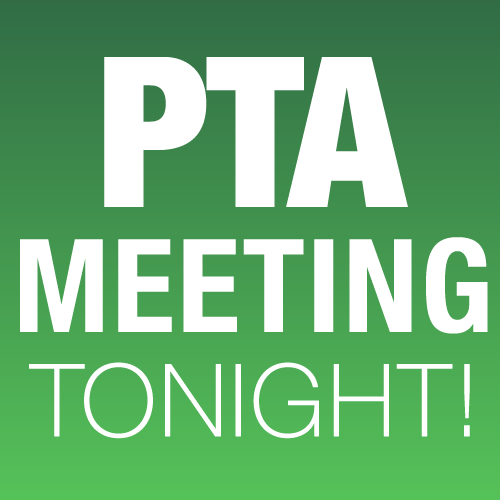 If you are planning on upgrading to one of our paid plans, we would highly suggest keeping these pages that have been pre-created intact as they will be needed to install things like your PTA/PTO Calendar, the Volunteer Form, the Contact Us form and the Online Family Registration form. If you are sticking with the Free Plan, feel free to delete anything you don’t need. Remember that our Upgrade Plans start at only $2.99 / month (with an annual plan) so upgrading is very cost effective and gives you access to many more features. If you’d like to learn more you can COMPARE PLANS or proceed directly to UPGRADE YOUR SITE. 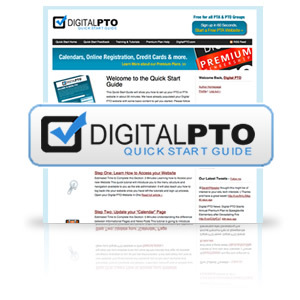 If you would like to learn the Digital PTO system in an easy to follow guided flow, we have set up a Quick Start Guide for you located at http://quickstart.digitalpto.com. This guide will walk you through every critical step in setting up your PTO or PTA website and train you at the same time. We highly suggest you complete this Quick Start Guide. We have made the guide as easy as possible to follow with graphical and textual instructions. Everything is broken down into small pieces so you can move as quickly or as slowly as you would like. If you would prefer to jump right in and learn how to use specific parts of our system, below we have highlighted a few of the key functionalities that you will want to know how to operate. Don’t worry, running your Digital PTO website is VERY SIMPLE! If you have any questions at all about how to set up your Digital PTO Website, this is the guide for you. Please be sure to take a look as it will be very important for your groups success. We are pleased to provide you with the first set of our complimentary Parent Group Graphic Packs. The images you see are already uploaded to your media library and ready for you to use. Feel free to share these graphics and use as you see fit. Need Help? Visit the Help Center! 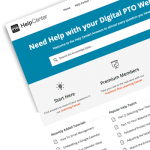 At Digital PTO we pride ourselves on creating easy to use websites, but if you have questions about how to do something, or how to use a particular piece of technology available on our platform, our Digital PTO Help Center is the first place to look. We have over 100 tutorials and instructional articles that wil walk you through step by step on virtually every aspect of our system. Plus, if you are completely stuck, you can submit a Support Ticket and our Support Experts will get back to you quickly! We never want you to feel lost, frustrated or confused at Digital PTO and our award winning Help Center should take care of the majority of your issues and questions. Digital PTO was built by a PTA President from Colorado that knew exactly what parent groups needed for their online resources and tools. The Digital PTO Premium Membership Plans include those extra features that make Digital PTO so unique and special. Paid Membership Plans unlock additional elements of Digital PTO’s functionality. If you are serious about communicating with your community online, and plan to use Digital PTO to save your PTA / PTO money that can be put back into your school, we urge you to explore the features and options available with our Premium Plans. It’s worth every single penny and much more. Every paid plan offers different features depending on the level you select. Below you can see a quick summary of the benefits of each of the 5 plans (starting at only $4.99 / month), and if you would like to compare the different plans please visit our PLAN COMPARISON PAGE. Enjoy this Video Training series on how to create the Ultimate Parent Group Website as we craft a site from scratch before your very eyes. Follow along every step of the way, or jump to your favorite sections, it’s up to you. This video series is based on the Premium Theme called Graphene 2.0, and while it is centered around that theme, it can still apply to virtually any theme we have on one level or another. Watch the Training to get a Complete Overview of Digital PTO. Be Sure to set your width to 240 or your photo will stick out over the edge! © Hickory Grove Elementary School PTO 2019 - Powered by Digital PTO - Theme by Colorado Web Solutions & Belouga.